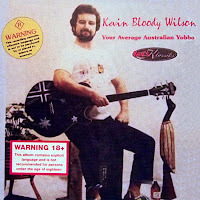 After a year or so of performing these songs to three miners and a dog in the pubs in and around Kalgoorlie, some of Kev’s mates suggested that he make a recording of his dirty ditties so they could take them away and play them to the rest of their mates. Twenty years, countless live gigs and millions of album sales down the track, Kevin Bloody Wilson has not only found his niche, he’s grabbed an esky and a deckchair and he’s made himself really bloody comfortable in it! 09 Wow, Did I Get Whacked! 0 comments on "Kevin Bloody Wilson - Your Average Australian Yobbo 1985 (Australia)"